No. 1. Muni's first streetcar, which began service in 1912, and is the oldest operating streetcar built for a publicly owned and operated transit system in the U.S. No. 1 was nominated for Landmark status by the City's Landmark Preservation Advisory Board in October, 2001. 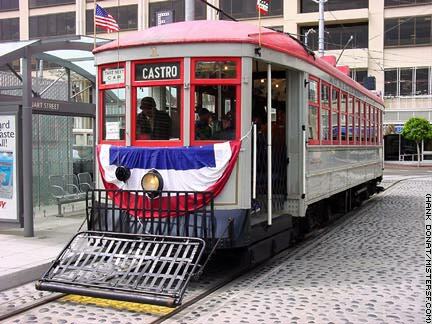 Thanks mostly to the efforts of members of the Market Street Railway, a non-profit group that supports preservation of historic rail service, San Francisco is home to the finest fleet of Vintage Streetcars in the country. The first proposal for an historic trolley line on Market Street was made in 1971. The late Maurice Klebolt lead the charge and was largely responsible for obtaining the first international streetcar. Car No. 3557, built in 1953 for service in Hamburg, Germany, was brought to San Francisco in 1979. While the lineage of the City's F-line can be traced through a myriad of proposal, initiatives, and measures through the decades, actual construction of the Market Street Transit Thoroughfare Project took place from 1988 to 1995. With the demolition of the Embarcadero Freeway, work began in July, 1993 for roadway and F-line extension to Fisherman's Wharf. With service to the wharf since March 4, 2000, our now vast and beautiful fleet of historic trolleys clatters its way from the waterfront to the Castro seven days a week. No. 578S. "The Dickie," built in 1895 for service in San Francisco. It was operated as a sand car for many years, and was restored to its original condition for the 50th anniversary of the 1906 earthquake and fire. No. 1007. Philadelphia Suburban Transportation Company (1948). No. 1818. Milan, Italy (1928). No. 496. Melbourne, Australia (1927). No. 952. New Orleans, USA (1923). The Market Street Railway organization has a fantastic web site with photos and background on the entire fleet!